Self-Guided Training lets you detect and protect from emf in your environment with the most convenient course of all the training courses we offer, and also the least expensive. Developed especially for those who want quality specialized training but prefer to learn online, at their own pace, on their own schedule, unconcerned about attaining certification for consulting or other professional credentials. This self paced online video course, which once sold for $949, has now been broken down into smaller, inexpensive modules that are available conveniently 24/7 in self-guided training format. Below we have left in place the former training content that has been re-incarnated into its new inexpensive, user-friendly Ready When You Are format. And YES, each module still awards you with a Certificate of Completion, and still leads to EMF Consultant Certification (if desired). Our EMF Expertise in Action course is all about action, helping you put our expert knowledge in action and at work for you right away, teaching you how to detect and protect from emf in 10 one-hour video lessons, with practical download support material and bonus features included in each class. The course can even be completed in a weekend for those motivated to do so. It does not include live interaction with the training instructor, nor any hands-on assignments, field trips etc., however the online final test results are reviewed and responded to by the instructor firsthand, in order to qualify the student to receive the Award of Completion certificate. Grounding Yourself effectively observing sound EMF principles. Locating an EMF-Free living location, Web Search, Realtor help etc. What Qualifies Me to Receive my "Award of Completion"? 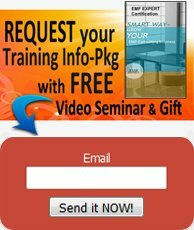 Each self-guided course is comprised of video lessons (with download supporting material for each lesson), and an Award of Completion certificate is presented online upon completion of the course. How does this training differ from the certification course? The Self Guided "Ready when You Are" training is self-paced online whereas the certification classes are held on a learning platform at a regularly scheduled date and time. The self-guided courses are designed to educate in key EMF Detection and Protection actionable skills, whereas the certification course is designed to graduate students wanting credentials to become professional EMF Consultants so the training content goes into much more depth, and includes field work, hands-on assignments, quizzes, tests, reports and interactive class discussion, and unlimited one-on-one access to the instructor. Will I need to buy any equipment for this course? 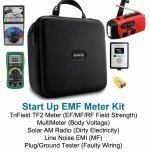 We recommend purchasing the EMF meter(s) that your training videos will demonstrate to you, as you learn EMF meter measurement methods to investigate your environment to assess your EMF exposure levels, however you are free to use any meters that you already have, or none at all. We also recommend books, videos, shielding material to protect from emf etc., which are all optional purchases for your use during and after training. Will I be included in the EMF Professional Directory (like Certified graduates are) when I have achieved the Award of Completion ? 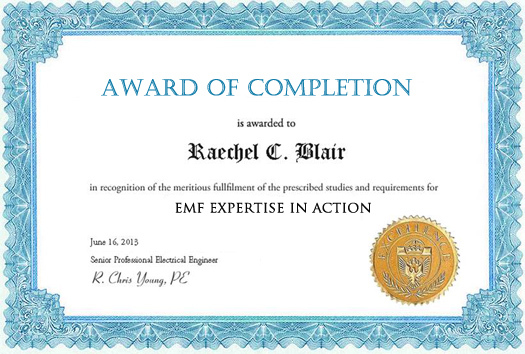 Yes, upon request, you can be included as an EMF Specialist (a non-certified designation), which will enable you to offer such things as writing/blogging services for EMF topics, Electrosensitivity support group leader, products that help technology consumers protect from emf, and many other non-certified types of expertise and services. Where can I print out the Syllabus and Training Topics for this course? The topic outline for all courses is included in the Training Info-Packet, which you can have automatically emailed to you, using the request form below. We also invite you to watch the 40 minute video, "Introduction to Certification Training" to learn more about all the training we offer, which will be helpful in getting a big-picture of the training possibilities open to you - whether self-guided or live interactive training.